Targum Onkelos as , related to the word we use for the final forms of some letters when they appear at the end of a word, 'at the end'. It had been two years, two long years for Yosef, languishing in jail while Pharaoh's chief cup-bearer was restored to his position of honour and trust at Pharaoh's court. How often had Yosef wondered what on earth was going on, how much longer he would have to endure before the promises of the famous (or infamous) dreams he had had started to come right. The issue of timing comes up again and again in the Hebrew Scriptures. We hear Eliyahu HaNavi (Elijah the Prophet) chiding the people of Israel on Mt. Carmel: "How long are you going to jump back and forth between two positions?" (1 Kings 18:21, CJB). King David cries out to G-d, "How long, Adonai? Will you forget me for ever? How long will You hide Your face from me?" (Ps 13:2, CJB). Daniel hears two heavenly beings discussing the vision he has just been shown, "How long will the events of the vision last?" (Dan 8:13, CJB), while the prophet Jeremiah's heart weeps for his people and land, "How long must the land mourn and the grass in all the fields wither?" (Jer 12:4, CJB). Even Yeshua Himself is concerned about timing. In all three synoptic gospels are recorded, "O faithless and perverse generation, how long shall I be with you? How long shall I bear with you?" (Matt 17:17; Mk 9:19; Lk 9:41, NKJV). The P'rushim challenge Yeshua with the same question, "How long do You keep us in doubt?" (John 10:24, NKJV). 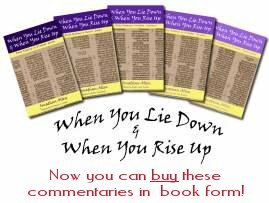 A number of contemporary writers have come up with memorable phrases to capture the way in which this question is answered, in essence saying: the moment when G-d's power is revealed is when His timing and His promises intersect. That is to say, G-d has a time for each of His promises to be fulfilled and He will bring every circumstance (and, if necessary, all of heaven and earth) to bear to keep His promise and to be shown faithful. Nothing can stand in the way of G-d's promise when the timing is right for it to happen. We can see this matter-of-fact approach taken in the gospel narratives of Yeshua's birth: "Here is how the birth of Yeshua the Messiah took place. When his mother Miryam was engaged ..." (Matt 2:18, CJB), "Around this time, Emperor Augustus issued an order for a census to be taken ... In the country nearby were some shepherds spending the night in the fields ..." (Luke 2:1,8, CJB). Application: Are you aware of the sense of G-d's timing in your life? Have you felt let down when something didn't happen when you thought it ought to? Pray about seeking G-d's timing for today.